A robe that belonged to China's 18th century Qing Dynasty Emperor Qianlong will go under the hammer in London on November 8, where it is expected to reach a price of 150,000 British pounds (more than 2,000). The silk robe was made in the late 18th Century for the emperor to wear twice a year during the performance of ceremonies to invoke rain and good harvest. It is embroidered with nine dragons clutching flaming pearls of wisdom interspersed with chrysanthemum flowers. It would have been stored away and used by several other emperors after Qianlong. The robe is being sold by the family of a British army officer who acquired it in Beijing in 1912. 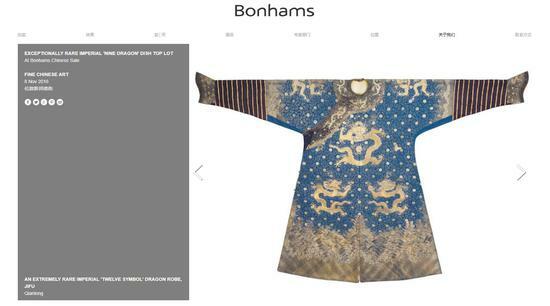 Dr. Benedetta Mattino, a specialist in the Chinese art department at the auctioneers Bonhams, said, "This robe is extremely rare. The only one that has sold before that is of a similar kind and period went for 190,000 pounds." 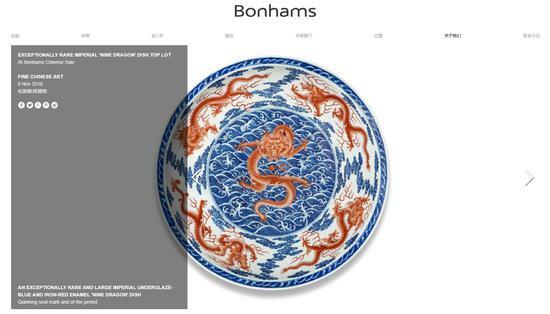 Other fine Chinese arts on the auction include an exceptionally rare and large imperial "nine-dragon" dish, which was used at imperial banquets or special imperial celebratory occasions. Measuring 47.5 cm in diameter, the underglaze-blue and iron-red enamel dish is one of the few dishes with Qianlong seal mark and period of this size known to exist. The price of the dish is estimated to be as high as 600,000 British pounds. A Tibetan parcel-gilt bronze figure of White Tara, dating to circa 12th-13th century, is also on sale at an estimated price of 150,000 to 200,000 British pounds.